STROM+ is a strong, reliable and slick power solution for your modular system. The STROM+ power module includes short-circuit protection and a replaceable fuse and ultra low ripple on each rail, also under full load. Unlike the basic STROM module, STROM + also offers a current sensing technology so you have your consumption under control at all times. Strom+ is an upgraded version of STROM module which shares all its useful features including a replaceable fuse and short-circuit protection, and on top of that includes a visual feedback of the current consumption. 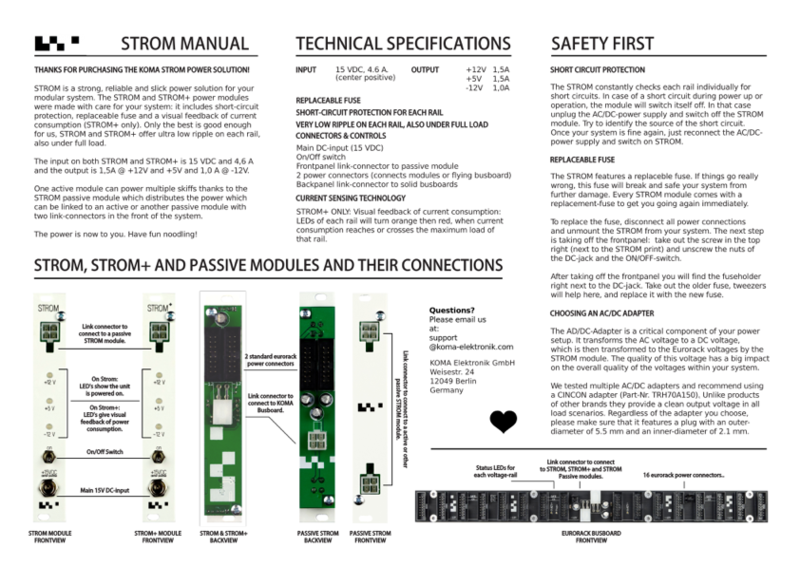 One active module can power multiple skiffs thanks to the STROM passive module distributing the power, which can be linked to an active, or another passive module with two link-connectors in the front of the system. Visual Feedback of the Current Consumption: LEDs of each rail will turn orange then red, when current consumption reaches or crosses the maximum load of that rail.